The Mission: Impossible movie franchise has now been around for over twenty years, and during that time it has continued to evolve. Originally, the intent was to bring on a different filmmaker with a unique style for each film, making each chapter unique among the rest. That is why John Woo’s second film was so different from Brian De Palma’s original and then the series changed again with J.J. Abrams’ third film. Abrams has remained on as a producer from that film on, though, and beginning with that chapter the franchise has developed more of a continuity. It has all led up to this year’s Mission: Impossible – Fallout, the first film in the franchise to feel like a genuine sequel to the preceding chapter and the first to bring back a previous film’s villain. Solomon Lane, the leader of the Syndicate organization that was captured at the end of Mission: Impossible – Rogue Nation is still in captivity at the beginning of this film, but his followers, now referred to as “The Apostles,” have continued his mission of terror across the globe. After Ethan Hunt makes a decision to put his team ahead of the mission, a case of Plutonium falls into the hands of an arms dealer looking to sell to the mysterious new leader of the Apostles known as John Lark. Ethan is ready to go to Paris, find Lark, and pose as him in order to buy back the deadly material, but the CIA has seen too many IMF missions go wrong and insists that their own man accompany Hunt on the mission. Of course, once Ethan and the CIA’s “hammer” show up in Paris, everything goes wrong and Ethan soon finds himself breaking his former antagonist Lane out of government custody. To make matters worse, it appears there could be a mole within their ranks. Some misdirection, a few plot twists, and lots of running later, Ethan and his team are in central Asia on a desperate mission to diffuse two nuclear bombs before Lane’s plan to create “a great suffering,” which he believes is the only way there can be peace, is executed. The Mission: Impossible films, especially the three released in the past decade, have existed largely as a way for Tom Cruise and the filmmakers to pull off the most outrageous, death-defying stunts they can imagine. Fallout is no exception. The stunts in this movie deserve their own feature-length documentary. Cruise trained for a full year to perform the HALO (High Altitude Low Opening) jump and he spent nearly as much time learning to become an expert helicopter pilot so that when you see him in the helicopter chase at the film’s climax, you see him doing all his own flying. The effort pays off as every single stunt in the film feels big, intense, and authentic. It is not all about jumping out of planes and helicopter chases, though, as Fallout also provides viewers with some incredible on-the-ground action set-pieces as well. A brawl that takes place in a lavish Parisian men’s room manages to feature some incredibly brutal fist fights while not feeling gratuitous, and providing maybe the year’s best GIF when Henry Cavill reloads his arms for battle. Meanwhile, composer Lorne Balfe samples and reinvents the classic Mission: Impossible theme music into a driving force that benefits every action sequence, most notably a pulse-pounding car/motorcycle chase through the streets of Paris. 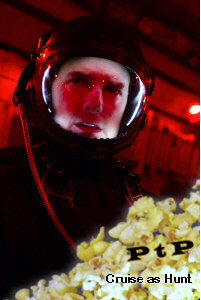 The phenomenal action scenes in Fallout would be enough on their own to warrant a ticket purchase at the box-office this weekend, but the movie also gives us some of the best character development in the series of Cruise’s Ethan Hunt. It certainly helps that in addition to the villain returning, this is also the first movie in the series to return the previous film’s writer and director. Given the franchise’s penchant for misdirection, it seems fitting that it may have finally found its perfect storyteller in Christopher McQuarrie, whose debut film screenplay was the Oscar-winning The Usual Suspects, perhaps the greatest misdirect in movie history. McQuarrie and Cruise have now had two movies to develop the character together and the result is a film that gives Hunt an emotional journey and payoff unmatched in the franchise’s history. In a blockbuster cinema era dominated by computer effects and superheroes, the Mission: Impossible franchise stands out, doing something that no other action film franchise is currently even attempting right now and doing it extremely well. There are a few small nitpicks that could be had—the least clever and most expository “this is your mission” opening in the franchise, the slowest moving countdown clock in movie history—but those insignificant details aside, Mission: Impossible – Fallout is a pulse-pounding thrill ride from start to finish that should not be missed. Mission: Impossible – Fallout opens today at the AMC Kent Station 14, the AMC Southcenter 16, the Century Federal Way, and the Landing Stadium 14 in Renton.